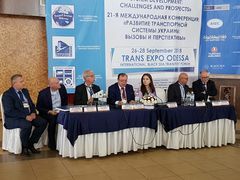 Upon the official invitation, Mr. Mircea Ciopraga, TRACECA Secretary General took part in the Conference within 15th international exhibition on shipping, shipbuilding and ports development “Odessa 2018”, held on 26 - 28 September 2018 at the exhibition complex of TRANS Expo Odessa, International Black Sea Transport Forum according to the event plan of the Organization of the Black Sea Economic Cooperation (BSEC). Within the framework of the Conference representatives of international organizations, invited guests and distinguished participants discussed the transport and logistics policy as well as the strategy of corridors development between Europe and Asia. The participants exchanged views on the role of transport and infrastructure strategies and their impact on countries and regions as well as the future trends of connectivity between West and East. Within the Forum, Mr. Ciopraga expressed special thankfulness to Mr. Alexander Syvak, General Director of ANA Media Compass Ukraine for the possibility to be actively involved to the Conference supporting the priorities of the country and created possibility to raise top urgent issues in transport and logistics system with authorized Ukrainian colleagues. Special attention focused on the issue of favorable geographic situation of Ukraine and transit potential create a real platform for the promotion of the dynamically developing transport-logistic business. The Black Sea ports are the main transit gates of Ukraine along the ITC TRACECA, but their infrastructure is obsolete at more than 50 % according various estimations. 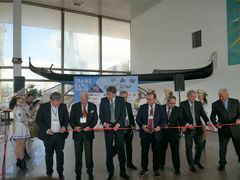 Within his speech, Mr. Ciopraga stressed that Ukraine has a powerful potential for developed port infrastructure, network of road and railway connections, inland waterways. Development of multimodal transport, in particular, railway-ferry and RO-RO traffic strengthen the significance of Ukraine in the Black Sea basin, taking into consideration its strategic situation on the border with Central Europe. Mr. Ciopraga added that the main criteria of competitiveness on performing favourable transportation based on the time, quality service and best price play a predominant role. The PS IGC TRACECA recommends the port authorities to revise the tariff policy with the view of optimization of the port dues’ sizes to support the competitiveness of sea routes both for transit and export-import freight. The issues of TRACECA Multilateral Permits system and “TRACECA Guide for Border Crossing” were of no small importance within the speech of the Secretary General. During its Chairmanship in the IGC TRACECA Ukraine officially launched an initiative to increase the quotas of “TRACECA” multilateral permits up to 500 permit forms for each member-country and currently this issue is under coordination with other member states. At the same time, the development of the shortest transport communications between the Baltic Sea and the Black Sea on the example of a container railway train “Viking” along the route Ilychevsk – Klaipeda, presents a specific example of this project availability and very significant for its further technological extension to other TRACECA countries. including the countries of Central Asia.